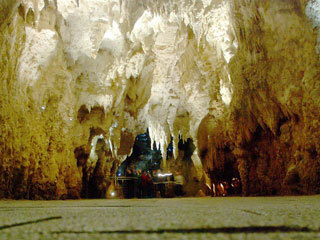 The main caves in the area are the Waitomo Glowworm Caves, Ruakuri Cave, Aranui Cave, and Gardner's Gut. They are noted for their stalactite and stalagmite displays, and for the presence of glowworms (the fungus gnat Arachnocampa luminosa). This article uses material from the Wikipedia article "Waitomo Caves", which is released under the Creative Commons Attribution-Share-Alike 3.0 License.